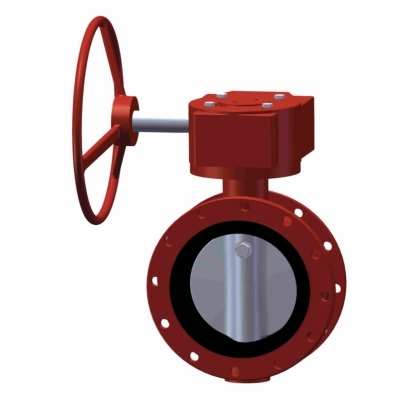 Butterfly Valve - AWWA C504 - D I - Model 3900 - 3"-24"
Butterfly Valves can be used in any installation where throttling is desired in relatively clean liquid services. The valve is bubble tight at full rated pressure allowing for dead end service. Being a fully rubber lined valve allows this valve to be used in rough service applications. Ductile Iron bodies translate into pure strength achieving three times that of Cast Iron alone. After Fusion Bonding, the seat is vulcanized to the body making a very corrosion resistant valve. The single piece 420 Stainless Steel shaft is capable of high torques and will handle any actuator on the market via the 5211 mounting plate. The polished 316 Stainless Steel edge of the Ductile Iron disc assures users of a perfect seal every time. Valve is available with 10 position locking Lever handle & worm gear with handwheel or 2” operating nut for buried surface.